We’ve got exciting news this week! The Social Media Examiner Show: Subscribe now (for free) and discover quick tips for marketing your business in our 10-minute daily podcast. Consume snack-sized social media content each day. The result: this daily dose of marketing know-how will equip you to take your social media to an entirely new level. Watch this quick video from our founder AND to discover how to subscribe via an iPhone. Subscribe via iTunes, Stitcher or RSS. Click here to help us spread the word about this new show. 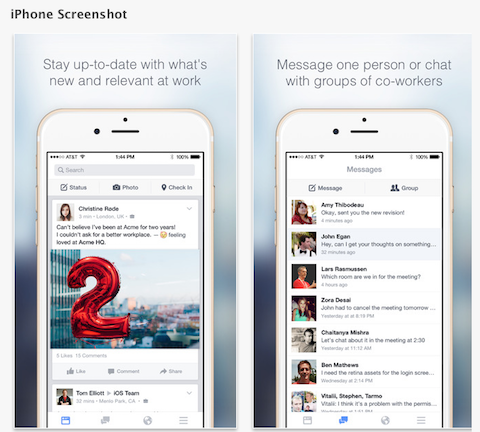 Facebook Unveils Facebook at Work: Facebook at Work is “only available to people who have set up a work account through their employer” and is currently in beta only on iOS. Post by Social Media Examiner. Q4 Social Login Report: Facebook Losing Ground to Google: Janrain’s Q4 2014 social login report shows that while Facebook is still the dominant way people log into websites, Google is closing the gap among music and consumer brand sites. Facebook lost 3% of its social login market share while Google gained 6% in 2014, going from 34% in Q3 to 40% in Q4. REPORT: Messenger Cuts Into Facebook App’s Reach: According to November 2014 data from comScore, the Facebook Messenger app is boosting its share of overall reach among U.S. users, at the expense of the social network’s flagship app. Messenger rose to fifth place in rankings of reach among smartphone apps at 43.1%. The main Facebook app still overwhelmingly topped the list at 69%. Facebook-owned photo- and video-sharing network, Instagram, took ninth-place position on the list at 30.7%. Social Media Update 2014: A September 2014 survey conducted by the Pew Research Center finds that Facebook has the highest concentration of users, capturing 71% of American adult Internet users and 58% of the entire adult population. However, its overall growth has slowed, while other sites continue to see increases in users. The study also broke down key demographic trends and frequency of use for each of the five major social networks: Facebook, Twitter, Instagram, Pinterest and LinkedIn. Data Driven and Digitally Savvy: The Rise of the New Marketing Organization: Forbes Insights and advertising technology company, Turn, surveyed 331 senior executives from a range of industries. Of those executives surveyed, 7 in 10 believe their reliance on data analytics for decision-making will either increase significantly (24%) or somewhat (47%) over the next 3 years. Data-driven marketing is credited with creating competitive advantages in customer loyalty (47%), gaining new customers (43%) and customer satisfaction (42%). Sixty-one percent note a measurable increase in ROI from data-driven marketing campaigns. Instagram 2015 Study: The Most Valuable Instagram Study for Your Business: Iconosquare released the largest Instagram study ever conducted, surveying 16,000 Instagram users, tracking 250 million media, and analyzing 39 billion interactions. The published results include 200+ pages of exclusive analyses, case studies and best practices. Their goal is to help marketers better promote their brand, understand best practices, analyze user engagement and recruit and retain users. How Long Does It Take to Plan Facebook, Twitter Content? : Research by Percolate reveals how long companies plan ahead for their content distribution on Twitter and Facebook. Twenty-two percent of respondents say their company creates Twitter content within the same day. The second most common prep time for Twitter content fell a month or more in advance (15%). Facebook is less real-time, with a majority of marketing executives planning content for the social platform anywhere from a month or more in advance (25%) to 2-5 days ahead of time (17%). 70% of Marketers Will Increase Social Media Spend in 2015: In their State of Marketing 2015 report, Salesforce polled 5,000 marketers about their budgetary changes for this year and found that 70% of respondents plan to boost social media ad spend in 2015. Seventy percent also say they will increase expenditure on organic (non-paid) social media marketing, too. Two-thirds (66%) of the marketers surveyed said that social media was core to their business. 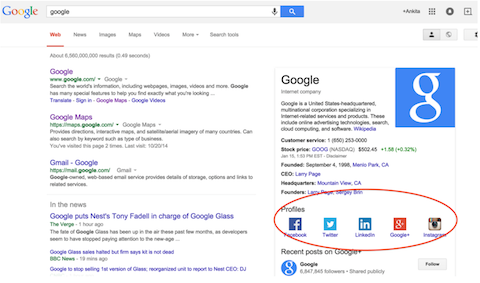 Accordingly, the same number of firms currently have a dedicated social media team in place. 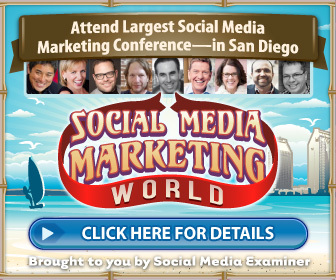 Social Media Marketing World 2015 is a conference designed to help you master social media marketing (brought to you by Social Media Examiner). Click here to learn more about Social Media Marketing World. 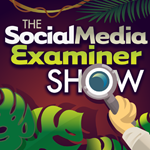 Listen to the Social Media Examiner show!